We all know that ‘humans are social animals’. Even one look at our evolution will vindicate the fact that we could survive all that we did because we were ‘smarter’ and ‘connected’.But are we connecting anymore? Look around and you would find that if not destroyed, the very basis of our social being is surely under serious threat. At homes, parents are busy staring at their smart-phones or at the television, kids are busy with their console-games, and teenagers are tuned into a song in the I-pod. Similarly, at workplace, bosses are busy looking at laptops, employees are logged into their company’s intranets, and Customer Care Executives are busy checking out customer records in CRM software rather than relating to the very same persons standing in front of them. And this last one is probably the most unfortunate and ironical. After all, customers are at the heart of all businesses and organizations, and if we are not connecting to them then there is something fundamentally going wrong somewhere. Yes, the biggest ‘moment of truth’ in a business is when you interact with your customer – be it through marketing or selling or any latest fancy term bestowed upon it. 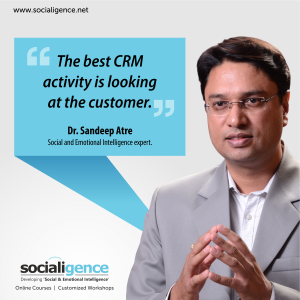 Eventually, any customer related function is more of a social activity than a commercial one. And it all comes down to establishing ‘connect’ – that intangible bond that brings people close to any person or idea. And how does anyone establish that connect? Well! It is all about connecting at emotional level – the level at which all important choices are made. And the most fundamental way to do it is by paying attention. It is even more important in sales because there are buyers who find it difficult to express their emotions through words, some others who don’t even like to do so, and then some who are not even aware of how they are really feeling. This is what puts even greater responsibility on the sales professionals. They need to prepare people’s emotional profiles and that too real-time and in their own minds. Many researchers have begun to term it ‘emotion analytics’. And all this can be done only when ‘you are looking at the customer’. Yes! This small behavioral tool from the realm of social & emotional intelligence can make a great difference to your ability to understand, counsel and ethically-influence a customer. And such customer-centricity makes… all the difference.